Pete Roa, the husband of actress Boots Anson Roa (in picture), is now in better condition after being admitted to the Intensive Care Unit (ICU) of Capitol Medical Center. Nasa Intensive Care Unit (ICU) ng Capitol Medical Center since January 31 si Pete Roa, asawa ng veteran actress na si Boots Anson Roa. Late dumating ang award-winning actress, former Philippine ambassador and Mowelfund official, sa launching ng ANI Awards sa Aliw Theater last Thursday, February 1. She has been taking care of her husband Pete who is suffering from repeated spasms and occasional blackouts. Her husband has been diagnosed with emphysema, pneumonia, and ulcer. The Roa family is now waiting for the biopsy report. Boots and Pete, recipients of Gintong Ina Foundation's Outstanding Parents of the Year award, started their romance on screen sa ‘60s television dance show, ang Dance O' Rama, where Pete was a co-host with Baby O'Brien. 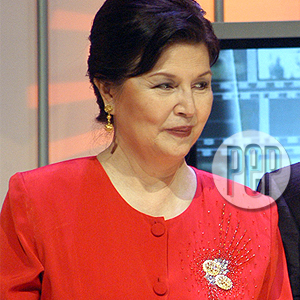 Ang naturang show ay naging pelikula sa Sampaguita Pictures starring Susan Roces. Boots, the winner of the 1973 FAMAS Best Actress trophy for Tatay Na Si Erap (tying with Vilma Santos for Dama De Noche), migrated to the United States in the early ‘80s with her family. Boots then was appointed Press Attaché and Cultural Officer of the Philippine Embassy in Washington, DC. Late 1990s na nang muling bumalik ang buong pamilya nila sa Pilipinas. Boots resumed her acting career and engaged in public service. She served as President and General Manager of IBC-13, and is currently the Executive Director of Mowelfund. In 2003, Pete suffered a bad fall that fractured his hip bone and required nine-hour surgery. According to Boots herself, Pete is doing fine na ngayon although they are still waiting for the final medical results, pati na ang biopsy report.